We have natural deodorant stones for sale. 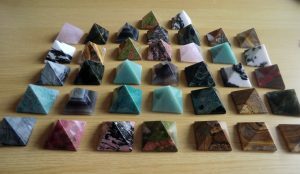 The stone is totally natural and has been shaped to be easy to use. 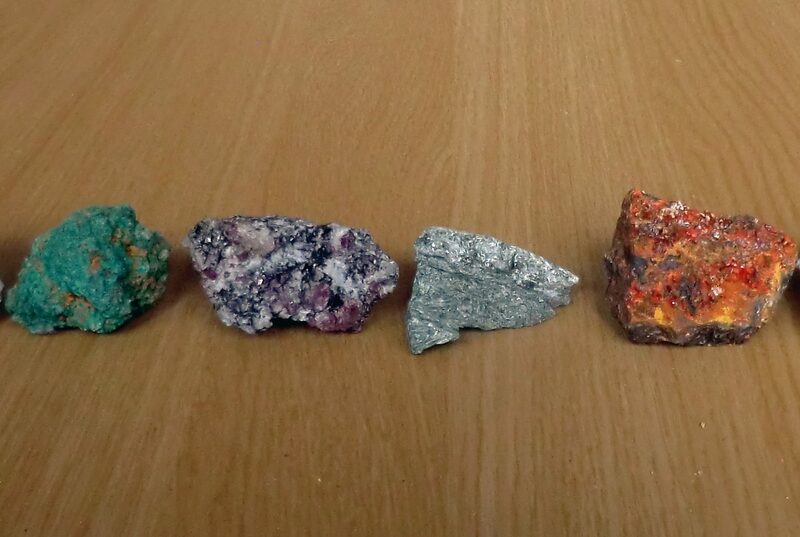 This particular stone has natural deodorant properties by inhibiting bacteria which are the cause of body odour. To use DeoKrystals the outer plastic cover is unscrewed. It can be applied to your skin directly after showering or bathing. If your skin is dry the stone should be wetted under a tap. The stone is then rubbed onto the underarm rather like a roll-on deodorant. After use the plastic cover should be replaced. Deokrystals are very long lasting and economic to use. 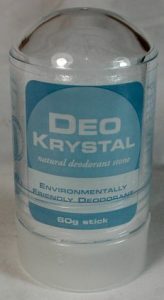 We occasional are able to offer loose deodorant stones which are supplied in a drawstring bag. At the moment we have none in stock but we hope to have them again in the future. The stone is potassium aluminium sulphate sometimes known as potassium alum. It is a naturally occurring mineral and deodorant stones have no added ingredients such as alcohol or perfume. It does not leave white stains on clothing as some chemical deodorants do. 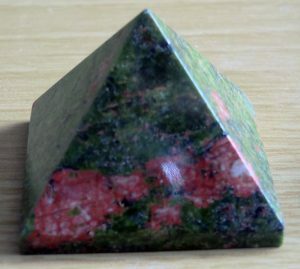 There is a long history of using this mineral for a variety of uses. In the past it hhas been used as a mordant in dying to fix colour in fabrics or leather. It has properties that purify water and it is especially to clarify lakes after storms have swept contaminants into the water. The powdered mineral combines with particles of contaminants so that they precipitate out and fall to the bed of the lake. It was formally used in the production of photographic films and as a fire retardant for fabrics. Medicinally it has been long known to be an astringent, antiseptic and deodorant. It has also been used to treat minor cuts and for soothing sore skin. In Ayurvedic medicine it is called phitkari or saurashtri and in traditional Chinese medicine its name is ming fan. 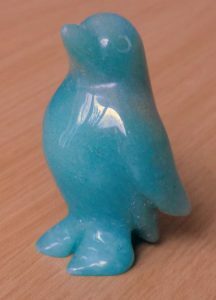 We thought we’d show you some of our range of carved and polished crystal animals. 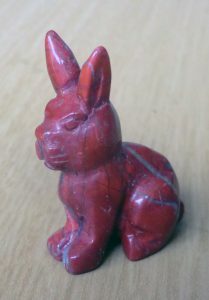 Each one is individually carved and we have elephants, turtles, dolphins, cats, frogs, snails and more. 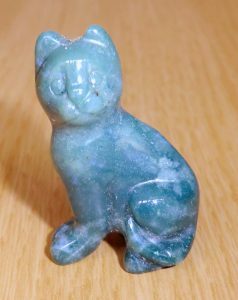 These animals are carved from many different stones but all are wonderful with the polishing showing the beauty of each crystal. You may not want snails eating your plants in the garden but these are a joy and guaranteed not to damage plants indoors or outside. 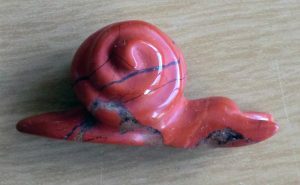 We have a number of snails in stock in rose quartz, red jasper and a number of other stones. 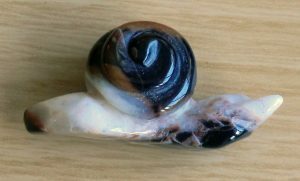 All of our snails are on offer at a reduced price at the moment. 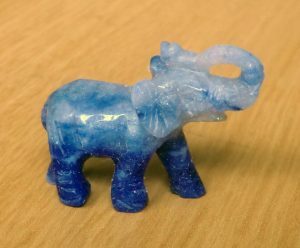 We have a range of elephants carved from soap stone. 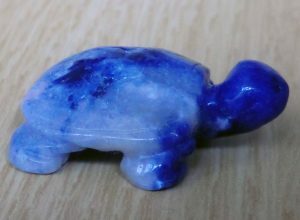 This is a beautiful but relatively soft crystal which as its name suggests a good choice for carvings. Despite this it takes a good polish. As well as individual elephants we have some offers for sets of elephants in different sizes. All of these are lovely and carved from a variety of stones. All of these animals are in limited supply and we are not likely to be able to source more in the near future. 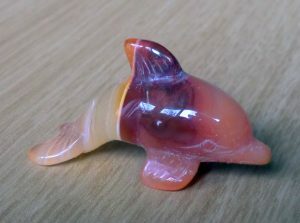 Another selection of carved and polished crystal animals. 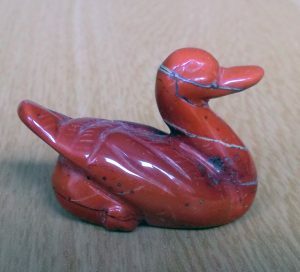 Some of our animals are made from stones which we are not completely confident in identifying. All of them are very beautiful and need good homes. We have recently had new deliveries of crystal and Tibetan singing bowls. 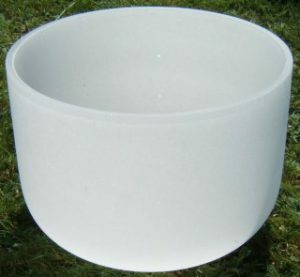 At the moment we have a large stock of all types of quartz crystal singing bowls with a good range of diameters and notes of frosted bowls, clear quartz bowls and practitioner bowls. Frosted bowls range in size from 10 inches diameter to 18 inches (25 to 45cm). Clear bowls range in size from 130mm to 202mm (about 5.5 inches to 8 inches). The price of frosted and clear bowls include a rubber ring and a suitable rubber ball playing stick. Practitioner bowls range in size from 150mm to 180mm diameter with a clear quartz handle. They are supplied with a playing stick – no ring is needed as they are hand-held. We now have hand-beaten Tibetan bowls from around 400g to over 4kg (about 14 oz to over 10 lbs). The diameters of these bowls range from 17cm to 35cm (7 to 14 inches). There are too many Tibetan bowls to list them all individually on the web site. If you have a particular requirement please email us. Machine made bowls are sold in box sets. 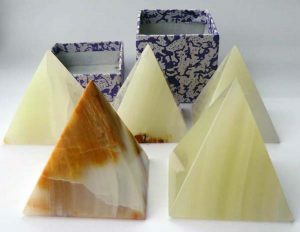 There are three different sizes of bowls including a playing stick and quilted mat in handmade boxes. We also have two larger sizes of machine made bowls that are sold unboxed but with a playing stick. 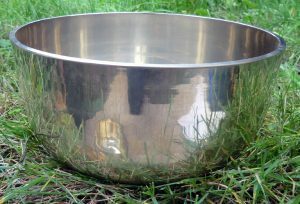 Choosing a Tibetan singing bowl can be difficult. Every individual can be drawn to choose a different bowl. 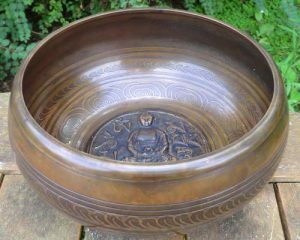 However, there are several types of Tibetan singing bowls – hand-beaten, machine-made and cast (Gulpa) bowls – and this post will describe each in turn. Firstly, hand-beaten Tibetan bowls. These are the sort of bowl most people think of when they talk of Tibetan singing bowls. There is a long tradition of making these in Tibet from where they take their name. As so many Tibetans live in exile in Nepal and northern India most bowls are now produced there. For this reason some people refer to Tibetan bowls as Himalayan bowls. Our singing bowls come from Nepal where families continue the tradition of hand making these bowls. The basic shape is produced and then the metal is stressed with a series of hammer blows. This is a highly skilled process to produce a complex quality of sound from the bowls. Tradition talks of seven notes from a bowl corresponding to the seven chakras. Hand-beaten Tibetan bowls are normally played by running a playing stick around the bowl. Wooden sticks play higher notes from bowls. Suede covered sticks bring out deeper tones from bowls. It needs a little practice to play bowls getting the correct speed and pressure against the rim of the bowl. This is a knack rather than a skill and everyone can master it after practicing for a while. Machine-made Tibetan bowls, as the name suggests, are made with a mechanical process. They are generally polished rather than allowing a natural patina to develop as with hand-beaten bowls. Machine-made Tibetan bowls are easy to play. The sound is simpler and more bell-like than hand-beaten bowls. Some machine-made bowls are offered in a set with a mat, playing stick and the bowl itself in a strong cardboard box. 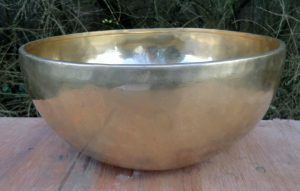 Cast or Gulpa Tibetan bowls have a similar sound to machine-made bowls. Some of them have a Buddha cast into the base of the bowl. 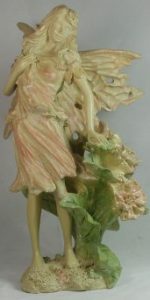 We stock various fairy themed items including statuettes, boxes, Tree Free greeting cards and candle holders. Some of these are in short supply and available in limited quantities. These are finely detailed resin statuettes with hand finished painted details. Each fairy design is supplied boxed. Most of these statuettes depict fairies standing and they are typically six or eight inches high. You can see exact details by using the link below to see our current stock. 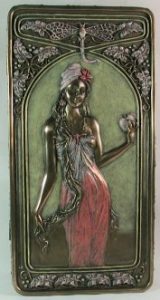 These fairy themed boxes have an Art Nouveau look and the bronze coloured boxes have hand painted details and raised patterns. The lids hinge up and the insides are well finished and velvet lined. The boxes are satisfyingly heavy and around eight inches long, four inches wide and just under three inches high. Tree Free cards are quality six by four inch cards made from kenaf which is a type of reed used to make the paper and card. There are twelve cards in a metal tin and the envelopes are equally beautifully decorated to match the cards. 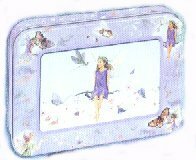 The tin is also decorated and the lid has a window in it which one of the cards or another photo or picture can be placed if you wish. We have one fairy themed design called Fairy Innocence. There are many other designs using various animal pictures and also some with mystical themes and others using paintings by Manet and other famous artists. We have some pewter candle holders which have a circular frosted glass centre to diffuse the light from a T light candle behind it. 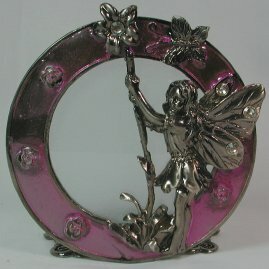 Around the frosted glass is circular pewter decoration with a fairy theme on a coloured glass ring. We also have other pewter candle holders with dragon and dolphin themes. For scrying many people choose to use black obsidian scrying mirrors. Obsidian is a natural volcanic glass. For scrying it is important that the obsidian used for making the mirrors is completely black without faults or blemishes. 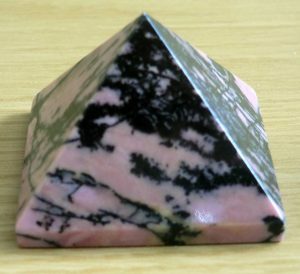 A lot of obsidian has white spots or bands of grey. 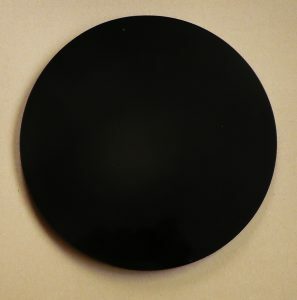 We have been able to source some mirrors made from Mexican obsidian which is of excellent quality and free of faults. The obsidian is cut into slices and polished all round so that the mirrors are double sided and even the edges are polished. 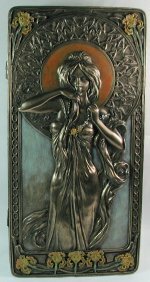 Our most popular sizes of scrying mirror are between four and six inches (10 to 15cm). Some of the mirrors are round and others are oval in shape. Occasionally we have larger mirrors up to a foot in diameter (30cm). 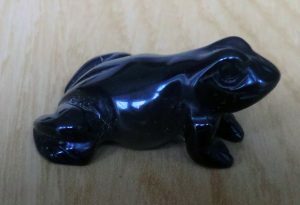 These are extremely beautiful and rare as they need to be cut from a very large piece of completely faultless black obsidian. The idea of the mirror is to give a blank surface allowing the person doing the scrying to enter a meditative state with the mind emptied of thoughts. You should look at the obsidian mirror letting the mind calm and allowing any thoughts to fade. Once in this state intuition and insight can appear. 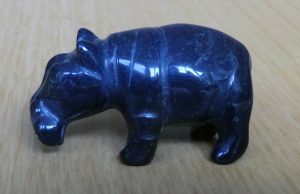 Although it is frequently thought of as a means of looking into the future many people use scrying to gain insight or to see shapes or symbols. As the mirrors are highly polished you need to look at it at an angle to avoid reflections. Some people like to prop up the black obsidian scrying mirror. We recommend that you use a stand of some sort so that it is safely positioned. China shops sell clear perspex stands intended to display plates which are good and not distracting. Metal stands run the risk of scratching the obsidian. Other people prefer to use the mirror laid flat on a table. There are other ways of scrying using crystal balls, made of glass or quartz, the surface of a bowl of water, a sheet of black paper or card. 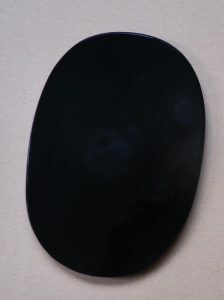 However, many people agree that using black obsidian scrying mirrors is the ultimate method of scrying. Crystal singing bowls have several uses – for healing, meditation, space clearing or to use as a musical instrument. This post will deal with each of these in turn. 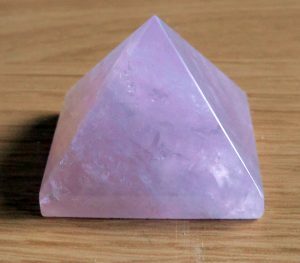 Many people use crystal bowls alongside healing systems such as Reiki or with treatments such as aromatherapy or reflexology. The sound produced by bowls seems to work on the energy system of the human body balancing clearing and grounding. Some people use bowls at the end of a healing session where it can provide a calming end to the treatment. Others prefer to start by playing bowls or using them at some point during the session. When to use the sound of singing bowls is best left to the therapist’s intuition and knowledge of how their therapy works best. Some people want to use particular bowls with specific notes although we feel that any bowl will do good work regardless of whether it is clear or frosted, large or small. It is advised to play singing bowls gently, at least initially, and to be guided by the reaction of the person receiving the treatment or therapy. The energy of crystal bowls can be directed or modified using crystals and other techniques which we will cover in another post. One of the main difficulties people find with meditation is unwanted thoughts that appear. All too often one thought leads to another and the person meditating only becomes aware of these thoughts after several minutes. Playing a bowl produces a sound which the person meditating will be aware of, but this sound seems to inhibit thoughts. The bowl should be played very gently so that the sound is not overwhelming or too intense. The sound does not necessarily need to continue throughout. Bowls can be played for a few minutes at the beginning to help all of the people get into the meditation. At the end the sound of a crystal bowl can gently end the meditation without anyone needing to speak. This technique works well equally well with groups of people. Sound is a well known technique for space clearing and improving the energy in rooms. Some people prefer to move the bowl around the room to play in different position. Because of the power of crystal bowls, there is really no need to do this. The bowl can be played to work on all areas of the room or space that you are clearing. Space clearing needs to be repeated at regular intervals. 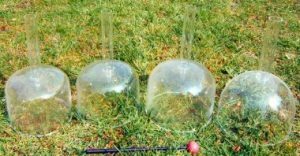 Benjamin Franklin invented the glass harmonica or armonica using a series of tuned glass bowls mounted on a shaft operated with a treadle. Mozart, Beethoven and many others composed pieces incorporating this instrument. Some people now use crystal bowls alongside other musical instruments. If you want bowls to be accurately tuned to a particular note please get in touch and we can let you know which bowls are most closely tuned. Having said this, something about the quality and complexity of the sound of crystal bowls mean that they often break the rules of harmony. Playing combinations of notes that would be discordant on other instruments often produces interesting harmonies. We are often asked about choosing crystal bowls so this seems a good topic to start off our new blog. There are three types of crystal singing bowls – frosted, clear and practitioner. All are made from pure quartz. To some extent the choice is down to personal preference but there are several factors you may like to consider when choosing a bowl. These are the most popular and probably the best known type of crystal bowl. The quartz is smooth on the inside and textured on the outside which gives them their frosted appearance. Larger bowls tend to have deeper notes and a longer resonance although any size of frosted crystal bowl will be very resonant. These are the easiest bowls to play as the soft rubber bowl playing stick is very forgiving. Some people choose to play frosted bowls with suede-covered wooden sticks, but we feel these are more difficult to use and make a scraping noise as they go around the bowl. If you want to have a frosted singing bowl that is easily portable we suggest that you choose a bowl 14 inches or less in diameter. Larger bowls can be very heavy and awkward to carry around. We stock bowls from 10 inches to 18 inches in diameter (about 25 to 38 cm). We avoid 8 inch and smaller frosted bowls which we find are often disappointing compared to the larger ones. 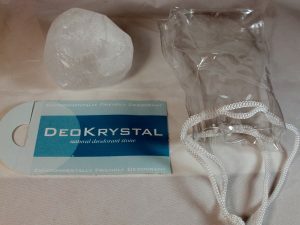 Look at our current stock and order Frosted Quartz Crystal Singing Bowls. The prices include a rubber ring to hold the bowl steady and a rubber ball playing stick. These bowls are smaller than frosted bowls and are made from quartz tubing which is completely clear. We stock bowls from 130mm to 202mm in diameter (about 5 to 8 inches). Like frosted singing bowls they are placed on a rubber ring to make them easier to play using a hard rubber ball playing stick. 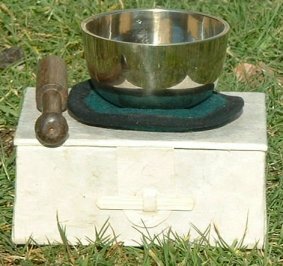 There is a knack to playing these bowls, similar to the method of playing metal Tibetan singing bowls, and they are not quite as simple to play as frosted bowls. The stick needs to be kept at an even pressure on the surface of the quartz to avoid clanging noises. After a bit of practice you will be able to play these well. Most clear bowls play fairly high pitched notes although larger bowls, such as 180 or 202mm diameter, can play surprisingly deep notes. Some larger clear quartz bowls can play more than one note or sound. Some play two distinct notes according to where the playing stick is placed, while others sound as if they are playing a chord. 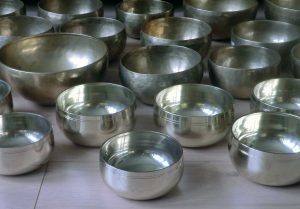 Clear singing bowls make a sound that is more direct than that of frosted bowls. Some people are attracted to this quality of sound while others prefer the gentler quality of sound produced by frosted bowls. This is where personal preference will guide your choice. Look at our current stock and order Clear Quartz Crystal Singing Bowls. Prices include a rubber ring and a playing stick. Practitioner bowls are clear bowls fitted with a tubular handle. They can be moved around easily as you play them with the same kind of hard rubber playing stick that you use for clear crystal bowls. The quality of sound is exactly the same as clear crystal bowls. It is possible to put small crystals inside the handle if you wish. You will need a cork or something similar to hold these in place. We stock them in various sizes from 150mm to 180mm diameter (about 6 to 7.2 inches). Look at our current stock and order Clear Quartz Crystal Practitioner Singing Bowls. Prices include a playing stick.